I spent the morning at Starbucks using their electricity and wifi to map out the next leg of my journey, then headed out to begin day 3 of my epic road trip. 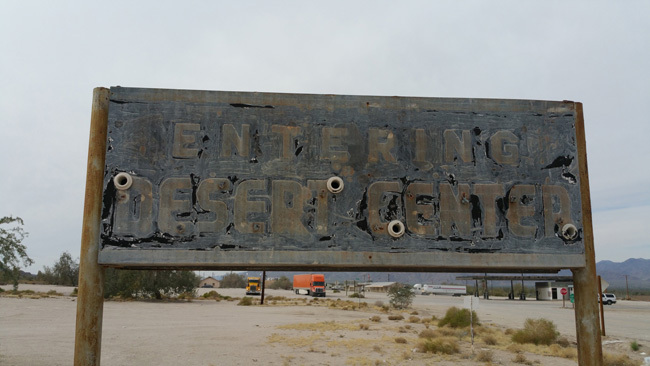 When I arrived at the town of Desert Center I was not prepared for how many opportunities it held for exploration. 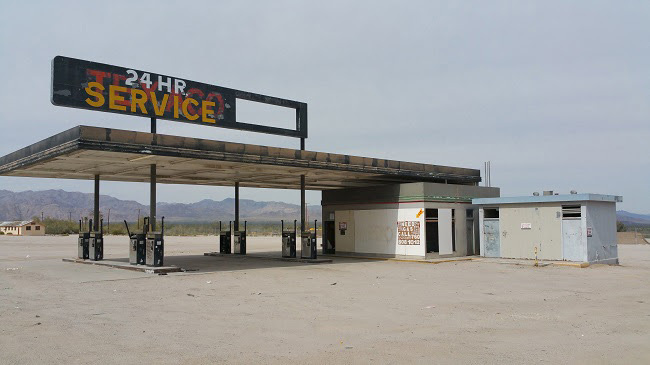 As soon as I got off the freeway I came to an abandoned gas station, near which many truckers stopped with their rigs. A bunch of tourists stopped to take pictures too. I had to wait for them to leave so they wouldn't end up in my shots. Looking down the road in either direction I saw so many abandoned structures, I knew I'd be there pretty much the whole day. 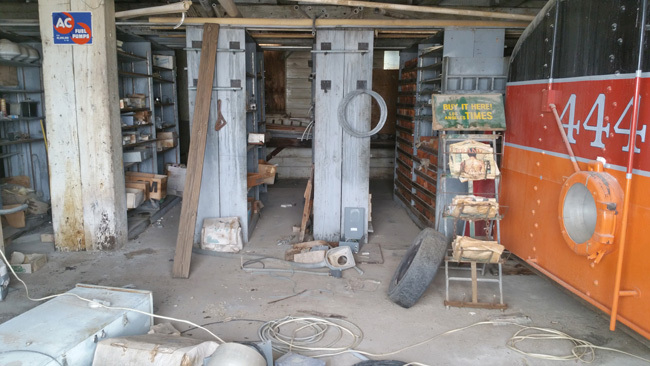 It was an urbex treasure trove, and I felt like a kid in a candy store. I ran around like a lunatic snapping pictures. 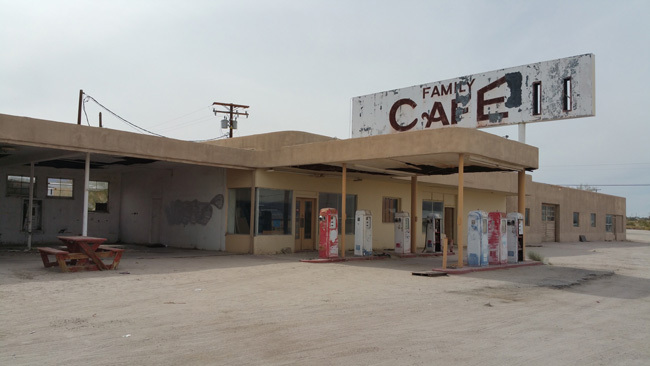 Desert Center currently has a population of around 200, with nearly 30% living below the federal poverty line. 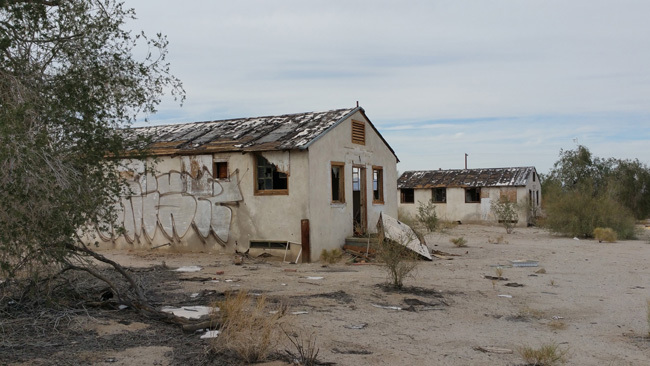 Despite its current bleak condition, Desert Center was once an important waypoint for travelers crossing the desert. 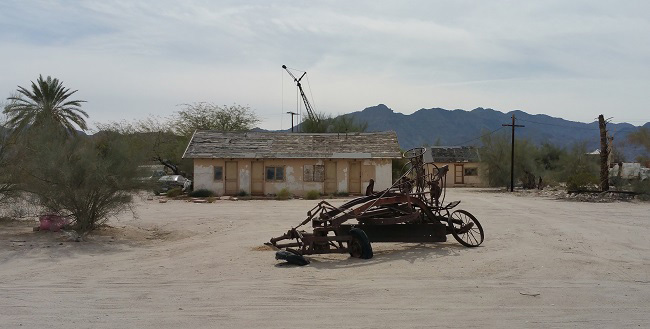 The town was founded in 1921 by Stephen Ragsdale, aka Desert Steve, a preacher and farmer. He opened quite a few businesses, including a 24 hour cafe, gas station, and lodging for travelers. Ragsdale was a teetotaler who didn't allow people under the influence of alcohol in his cafe, and was said to beat them with a stick if they came in. In 1950 he was accused of having an affair with one of his employees and exiled himself to a cabin on Santa Rosa Mountain for the rest of his life. In 1942 General Patton ordered the construction of the Desert Center Army Air Field to train soldiers for combat against Rommel's forces in the North African deserts. The base was closed in 1944 after the Allies defeated the German forces in North Africa. 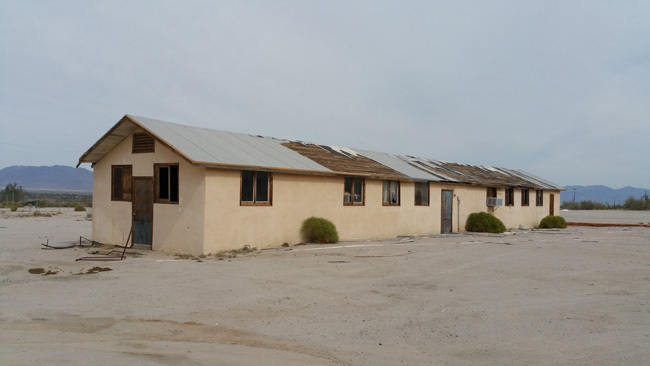 Desert Center quieted back down after the closure of the base. 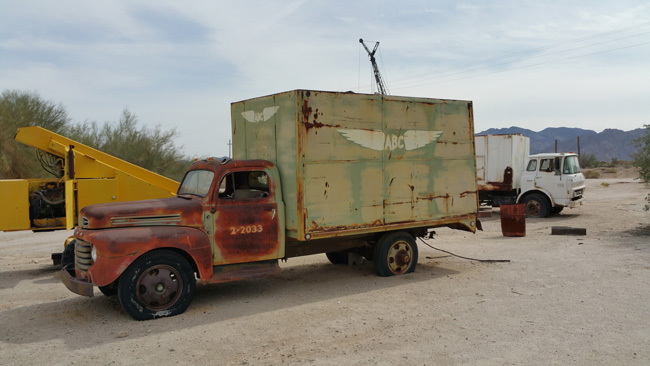 It might surprise you to learn that Desert Center is the birthplace of Kaiser Permanente. It also served as the filming location for scenes from several movies, including Terminator 2: Judgment Day. Ragsdale Rd, the town's main drag was surrounded on each side by a row of 4 or 5 businesses, most of them adjoined to one another. 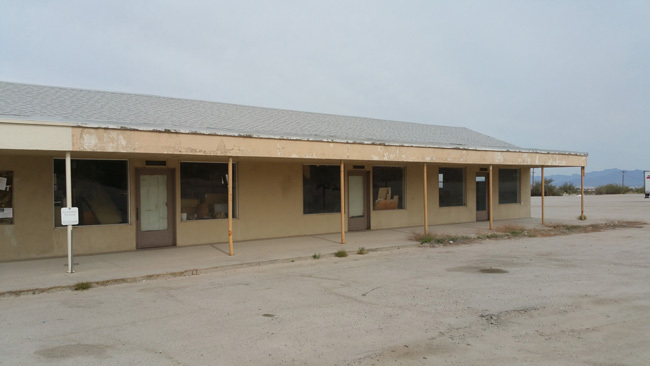 The only building among them that was still open was the post office. 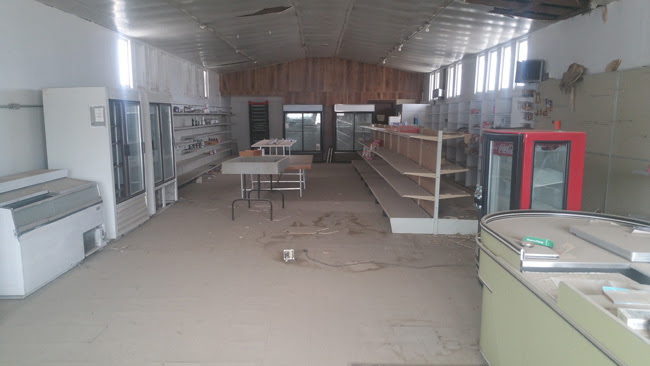 An old grocery store stood deserted. 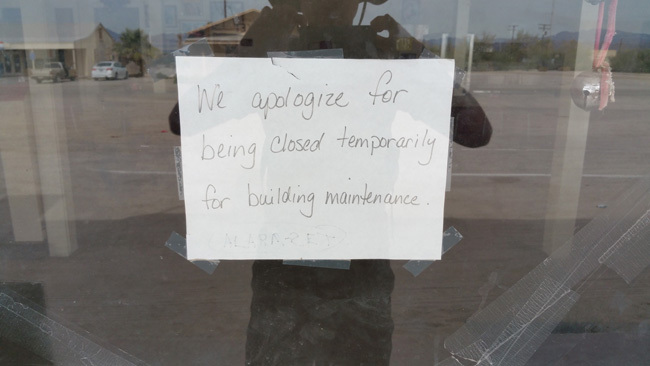 One of the old cafes had signs saying they were temporarily closed for building maintenance, but there was no indication that they’d be opening again anytime soon. 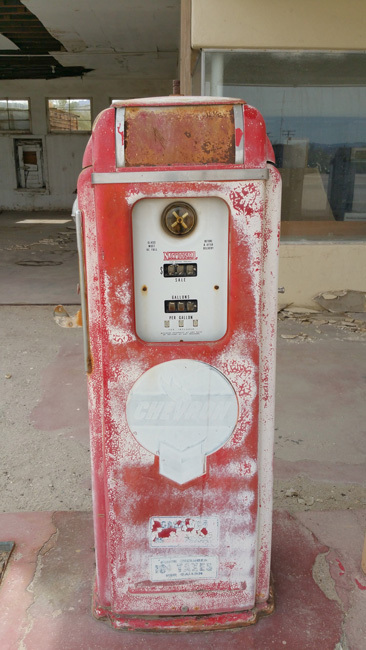 One of the cafes was also a gas station with very old pumps. Next to it stood an auto and machine repair facility of some sort. I stuck my phone up to the glass and took some pictures. 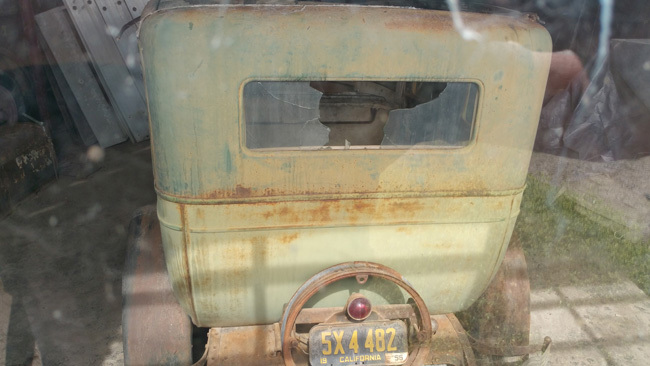 There were many tools and vehicles inside, undisturbed and quite old. I imagined the place could be turned into a museum one day. 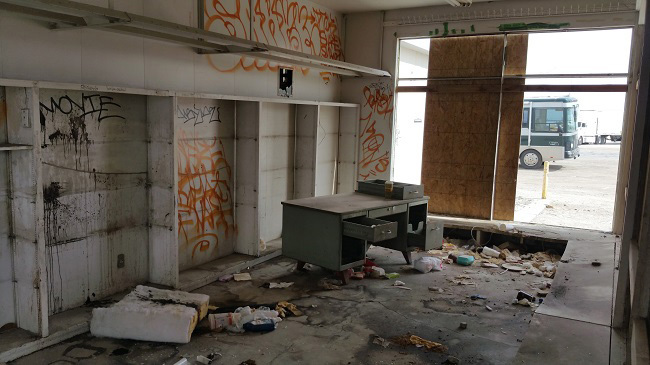 It seemed the vandals had come to mutually agree that the buildings along that stretch of road would remain untouched. I was amazed that all the buildings along the main street still had unbroken glass windowpanes. Finding abandoned buildings with windows intact is exceedingly rare. It seems inevitable that one of the large front windows will be broken one day. I wonder how rapidly the place will deteriorate after that. Set back a little further from the road were a few structures left behind by the military. 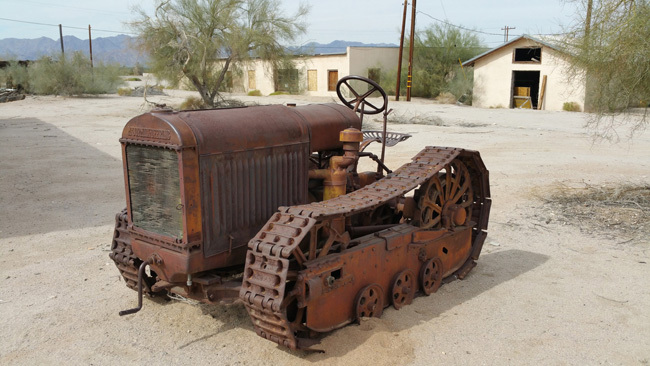 There were also quite a few very old tractors with cranks on the front, and some even older farm equipment. 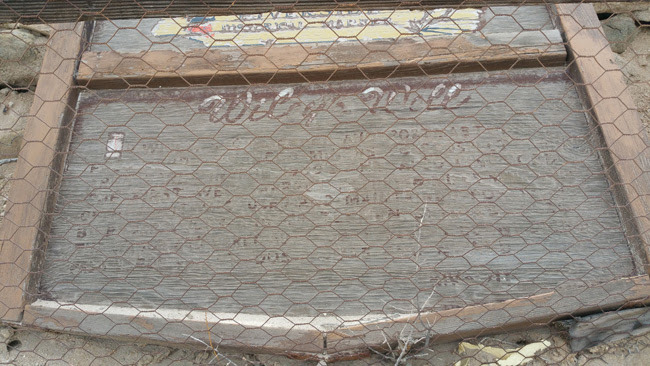 The equipment pictured above was inside a chicken wire enclosure and had a weathered old sign, no longer legible, indicating that it was a historical marker. Down the road there were a dozen or so abandoned military homes. They were in very bad shape, the walls torn up by scrappers seeking copper wire and pipes. Everything was pretty broken. 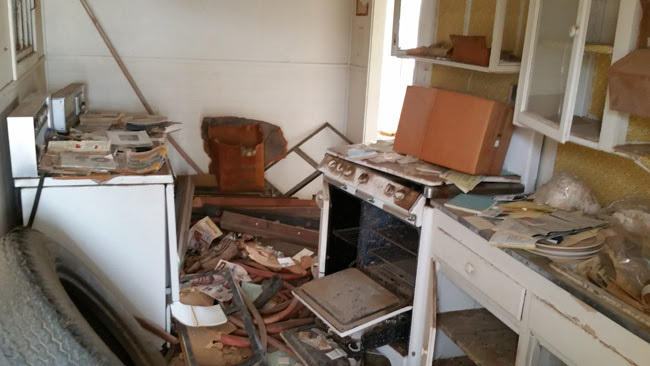 The former residents had left a ridiculous amount of possessions inside those little homes, sometimes piled high enough that it was difficult to enter. There were tvs, clothes, furniture, canned goods, even a prescription bottle with pills. Someone had poured them out on the little kitchen table, along with some caffeine pills and vitamin B12. One of the houses had burned down. 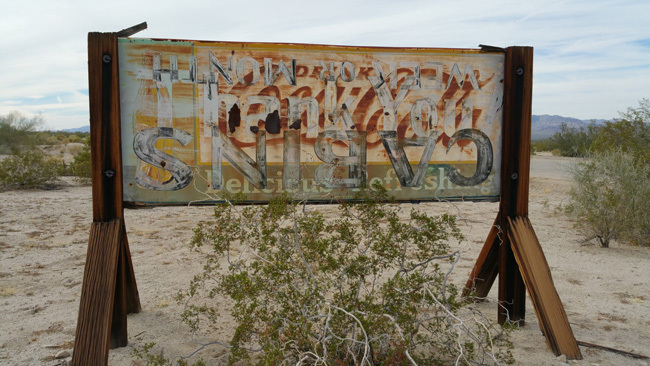 This old sign stood near the homes pictured above. It had been an awesome morning, and so far I'd only explored about half of Desert Center. I crossed Highway 177 to the eastern half of the town, where I would spend the next several hours exploring some pretty incredible sites. I'll tell you all about them in my next post. I grew up there !!!!!! Right on. Such a neat place to call home. Very interesting stuff there, especially in the mechanics shop. I would suggest it was multi-purpose, as there were different vehicles. The black/red/orange object almost appears to be a railway locomotives exterior casing. Not sure if there were any railways in the area. It did appear to be a locomotive. I was really surprised to see it there. There are some railways nearby, but it seems like it'd be pretty tricky to transport a locomotive to a workshop without any rails leading to it. This town is absolutely phenomenal. I definitely recommend checking it out if you get the chance. Actually it was a movie prop. The movie starred old Burt Lancaster and Kirk Douglas as old robber just released from prison. The steal a train and after a chase crash through the Mexican border. The train gets buried in the dirt cause the train tracks stopped at the border. 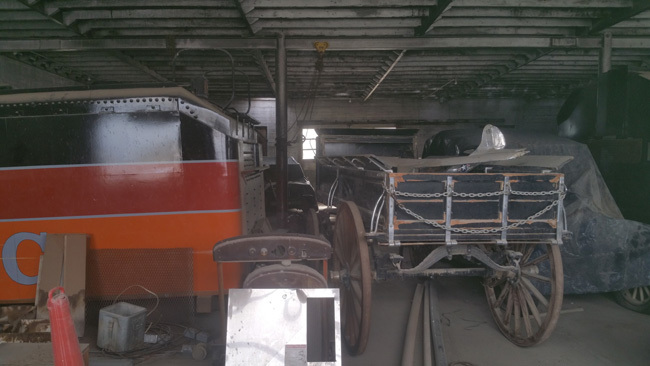 The black and orange object is the prop for the train. Thanks for the info! Mystery solved. I just saw the end of "Tough Guys" and had to find out where that prop was and that led me here. The actual locomotive from the movie is the 4449 Daylight and is in the Oregon Rail Heritage Center in Portland, OR. The 4449 Daylight pulled the original American Freedom Train in 1976. 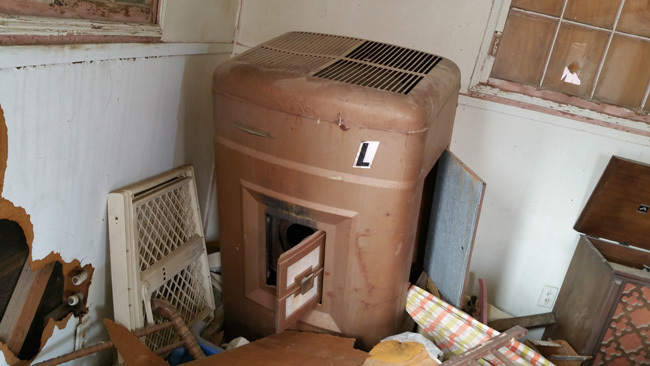 It is the only one of its kind left and is still working today. Awesome! Thank you for the information. It's great to hear that the 4449 is still operational! That old has station/mechanic shop has never been open as far back as I remember, but all of the other businesses but one were still open in '98 when I went back to visit my grandparents. The one that was closed up most of my childhood was across from the newer gas station and for a little while I remember it sold food. We always called it the hamburger stand. I wish some of them were still open when I visited. I would have loved to eat lunch there. Unique little places like these are becoming rare these days. 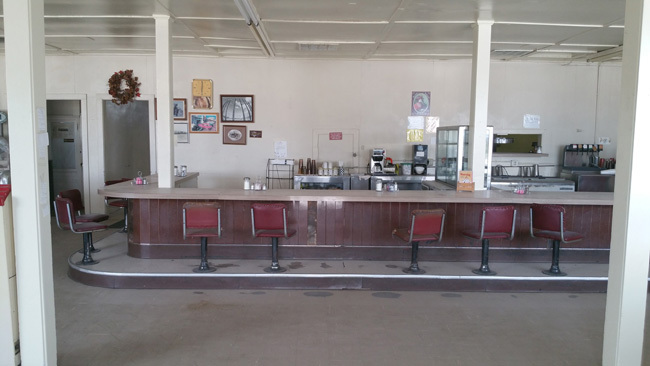 I would love to see what this place looked like when most of the businesses were still open. I have recently started my own blog, mostly about pop culture when I was a kid, but I think it might be a fun idea to link to pictures of where I grew up. Would it be okay with you if I grabbed a few of yours and linked to you? Or would you have a different website you'd prefer me to link to? Assuming you don't mind if I use them. I don't have any pictures of my own from back then. I would love it if you used my pictures and linked to this site! I'll be sure to check out your blog too. Hey, thanks! I'll keep you posted. Can you please message me at teawhoa@gmail.com with any info you'd like me to include, and so I'll have your email address? Sudden change of plans. It's going up tomorrow morning. Don't expect a huge spoke in views. lol I just have a handful of readers myself. 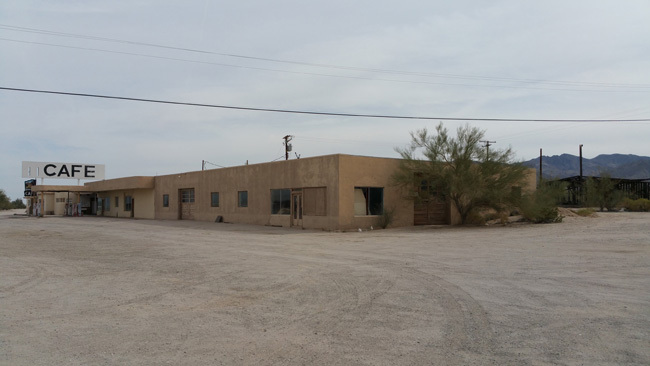 Desert Center is still owned and occupied by members of the Ragsdale family, and is not 'abandoned'. That's why the windows are still intact, etc. I would not suggest entering any structures -- you may receive a hostile reception if you do. Thanks for the info. That explains why there is no vandalism on the main street. I grew up in nearby Eagle Mountain 12 miles up the lone road from Desert Center. Some of your information is correct and some of it is not. It is a great little area. Our town of Eagle Mountain was an iron ore mine built by Kaiser. It was definitely a company town. When Kaiser went bankrupt the town became deserted. That was in 1986. Lake Tamarisk, 3 miles up the road from Desert Center is still fairly operable. The Ragsdales still own Desert Center. 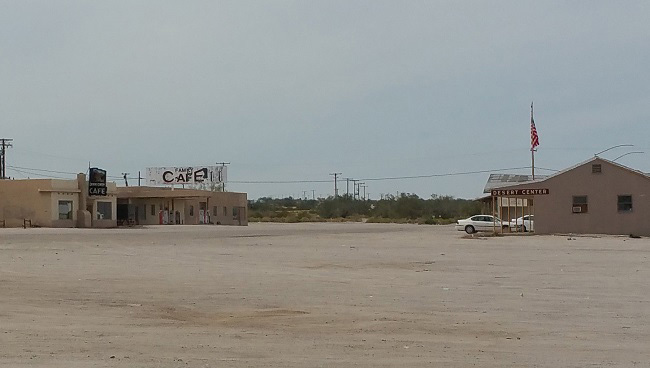 It is sad to have grown up out there and remember how it was compared to the ghost town appearance of today. 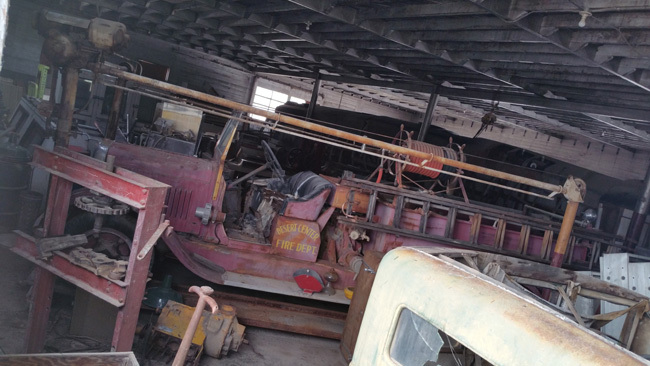 Research Eagle Mountain Kaiser Steel Mine for more information if you are interested. The railroad went from Eagle Mountain carrying iron ore pellets and took them to the Fontana Kaiser plant. Eagle Mountain was in operation from 1948 to 1986 or there about. Cool! Thanks for the info! Have you ever been back to Eagle Mountain since you left? 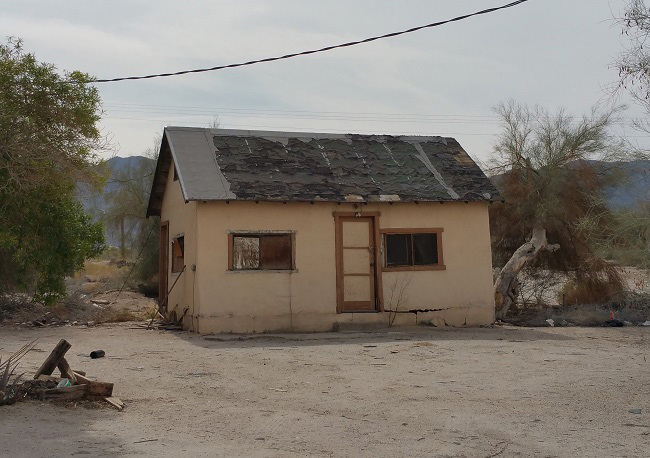 The Ragsdales who owned the hamburger stand live about five miles up the road in Lake Tamarisk. I remember the store when it had just the worn wood floors. The barracks area was known as Hollywood. A Baptist church once met there as well. 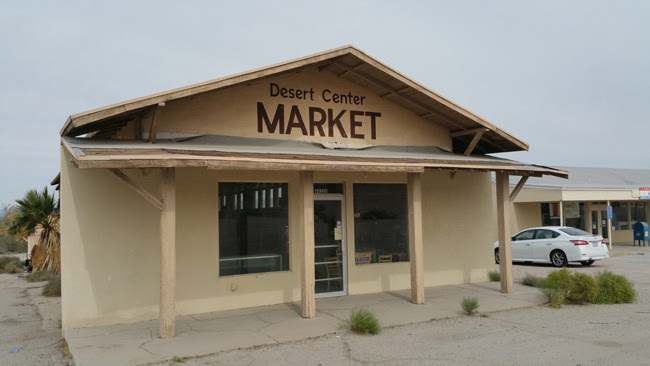 Desert Center was a big part of our lives. I grew up in Eagle Mountain. Thank you for sharing, John! I love that the barracks area was known as Hollywood. Do you have any idea how it got that nickname? Grew up in desert center and went to k-8 grade in Eagle mountain. My family still lives out there and I visit often. I helped Film a movie in Eagle mountain about two years back. It's fenced off completely and my best buds dad lives up there and maintains the little bit left running. You must know the place like the back of your hand! It's nice that your family gives you a good reason to go back and visit. I need to go back one of these days. Such an amazing place. And I'd like to see Eagle Mountain up close, if it ever becomes possible. What movie did you film in Eagle Mountain? 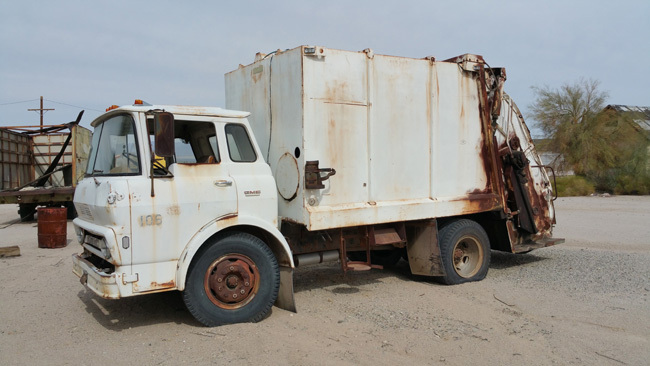 I remember that any trip across the desert HAD to include a stop at Desert Center for water, check tires, fanbelts, refill your canvas waterbag with water. From Blythe to Indio is about 97 miles and it took you the entire day to get there. A hero was one who could make it to Indio and back in one day. It's amazing how much things have changed, and sad to see that what was once an important stop has become so neglected. I lived up the road 14 miles before Blythe. My folks had a place called Skyway on the Highway. It was torn down when the freeway went in. 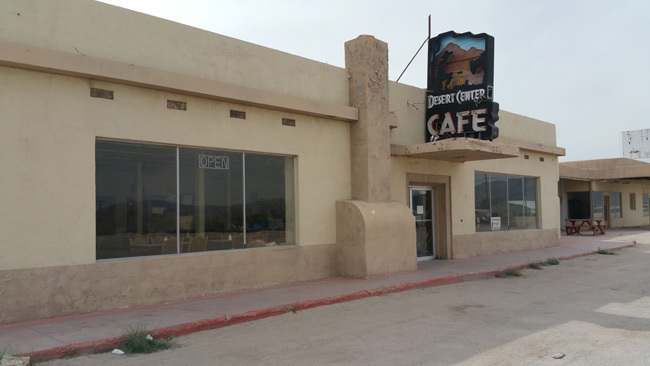 I remember Desert Center as a busy, bustling place along the highway. Always lots of cars and people there 24/7. I lived there for many many years I moved there in 1976 and moved when I graduated in 1990. My brother and I still own land there. It breaks my heart when I go there everyone has a home town to go to and it leaves me so emotional. 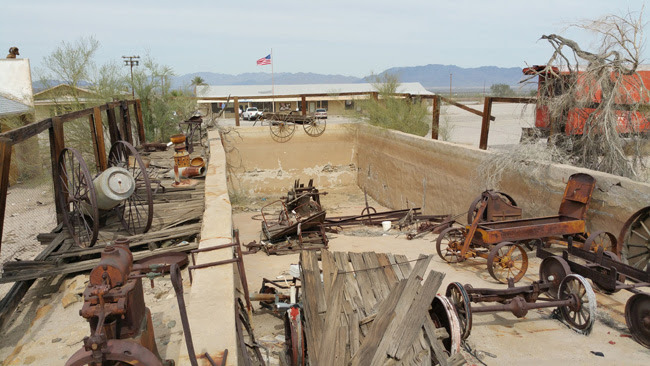 Desert Center is a fascinating place with a robust history. It deserves to be preserved and celebrated. I was disappointed that even the historical marker has fallen into disrepair. 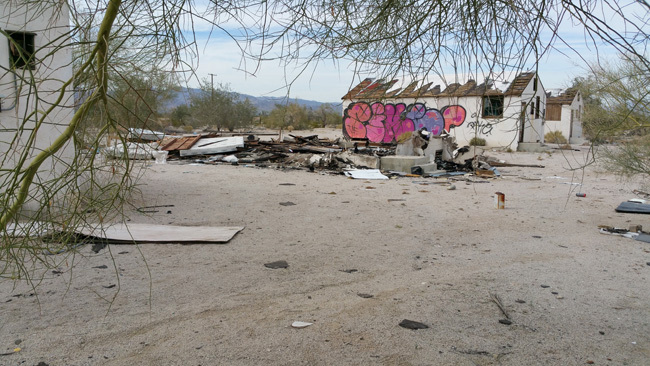 Maybe with some investment, it could become a destination that attracts visitors from Joshua Tree. Thanks for the updated info, Bob! I'm glad I got to see them before they were removed. Desert Center in 1952 was where a once-thriving "flying saucer" cult movement based at a snack bar on Mount Palomar began and took off, thanks to a guy named George Adamski and a few of his "true believer" groupies. Truth is that Adamski and his pals had recently seen the classic "Day The Earth Stood Still" at a movie theater in Indio, and decided to make up having a "visit with an alien" story in hopes that it would bring about world peace. Believe it or not, that group - small though it may be today - still exists! I made a no-budget "docudrama" short film in 1989-90 with a scene set in the Desert Center Cafe. I recall asking a waitress if it would be okay for me to shoot footage out in front of the cafe, and she said, "Go ahead!" We also filmed in the desert a few miles north of DC. BTW, We had lunch at the DC Cafe, and it was good! They even sold postcards and keychains and other tchotchkes bearing the painting on their sign...good grief, I still have them! How cool! 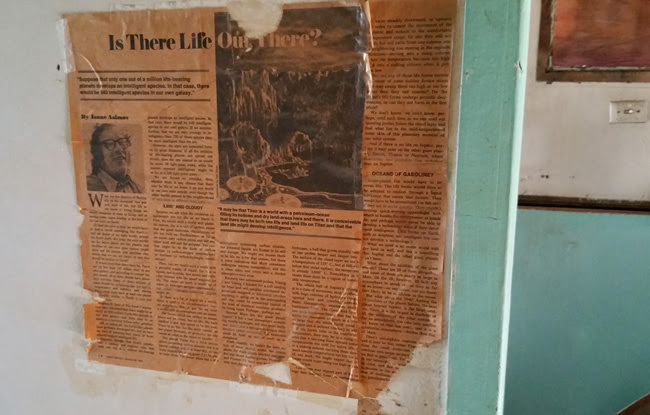 Thanks for sharing the slice of history! How did your film turn out? Is it available to view online? Jim Sullivan, the story and pictures were very interesting. I have been going to Parker, Arizona on the Colorado River since I was 10 years old and have been staying at Fox's RV Resort for 37 years my Second Home. 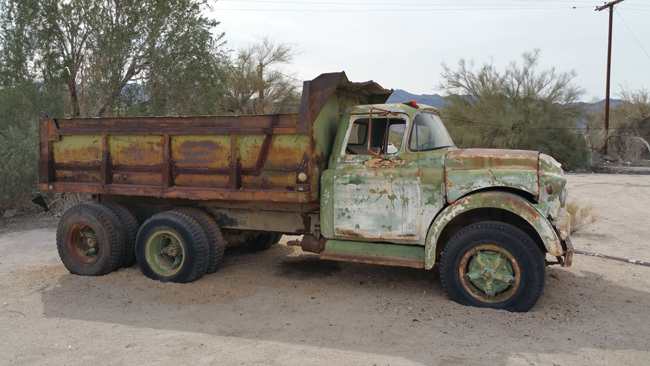 In May this year I am going to start writing a BOOK - AS THE RIVER FLOWS IN PARKER, ARIZONA. I am not a Editor, Writer or Publisher this will be an informal book. 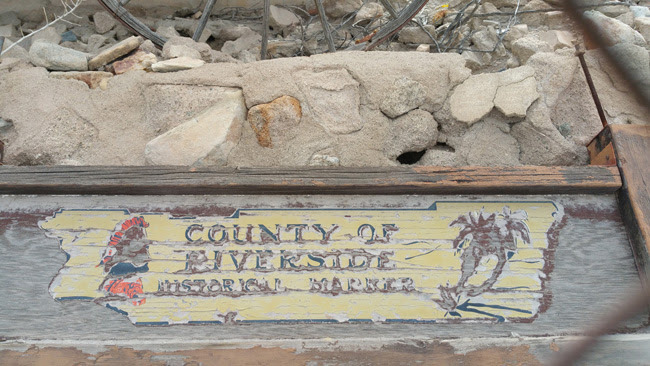 Each person can write a paragraph, Page or Pages of their stories about the Colorado River. I will then type an informal word document, add names and photos. This is just going to be for fun and you can be anonymous. If anyone is interested in this email, please send me an email to either Kylene.kay.moran@verizon.net or Kylene.kay.moran@gmail.com. In the email include your Name/Maiden Name, your email address, cell phone in case I need to contact you. You can write whatever you want everyone wants to read about all the good times, memories, what has changed, what you remember that they have had at everyone's HAPPY PLACE.